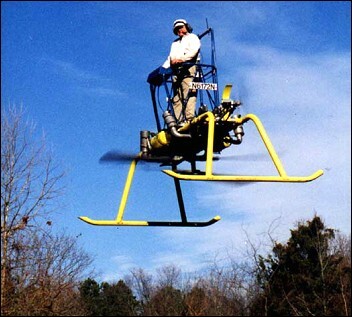 There were several attempts in the 20th century to build a flying platform that could carry a man. These received a lot of attention from the military and also appealed to businesses as a way to give everyone their own such device. The PAM100B, which was developed by the PAM group (Performance Aviation Manufacturing Group) in the 1990s, fits into this category. This machine used counter-rotating rotor blades that were located at the bottom end of a metal frame that carried the pilot/passenger. It was flown by the pilot shifting his/her body weight, which in turn shifted the centre of gravity of the machine, leading to a change in the platform's altitude. Heading was controlled by two small propellers mounted on both sides of the platform. Reported flying heights and speeds seem to be relatively low (20 feet and 25mph), but these figures meet the expectations of an open flying platform. The PAM 100B used two engines, with the machine designed to fly on one of them in the event of the total power loss of the other. From a commercial point of view, the PAM 100B performed no better than all of the other initiatives trying to sell personal VTOL machines: it also met a dead end. Do you want to comment the PAM Group PAM 100B platform helicopter?